Lord mayor of London (1896-97); second son of Sir Benjamin Samuel Phillips; born in 1840. George Phillips, who derived the name of Faudel from his uncle, was educated at University College School, completing his studies in Berlin and Paris. He then entered his father's business. In 1867 he married Helen, daughter of Joseph Moses Levy, the proprietor of the "Daily Telegraph," and sister of Sir Edward Lawson, its present chief proprietor. His sister Sarah is the Lady Pirbright. He was appointed sheriff of London and Middlesex (1884-85); succeeded his father as alderman of the ward of Farringdon Within (1888); and became a governor of the Honorable Irish Society (1894). The following year he was created high sheriff of the county of London, and in 1896 he became lord mayor of the city of London. As chief magistrate of the city, Faudel-Phillips received Queen Victoria at Temple Bar on the occasion of the Jubilee thanksgiving service which was held at St. Paul's Cathedral and subsequently at the Mansion House. His year of office was one of remarkable philanthropy. He raised funds which amounted, in the aggregate, to £1,000,000 for the relief of the famine in India and for other charitable objects. He was the recipient of numerous honors at the close of his term of office, when he was created a baronet, and, in recognition of his services to India, received the Grand Cross of the Indian Empire. He also received numerous foreign decorations. He holds many municipal and charitable offices in connection with the city of London. 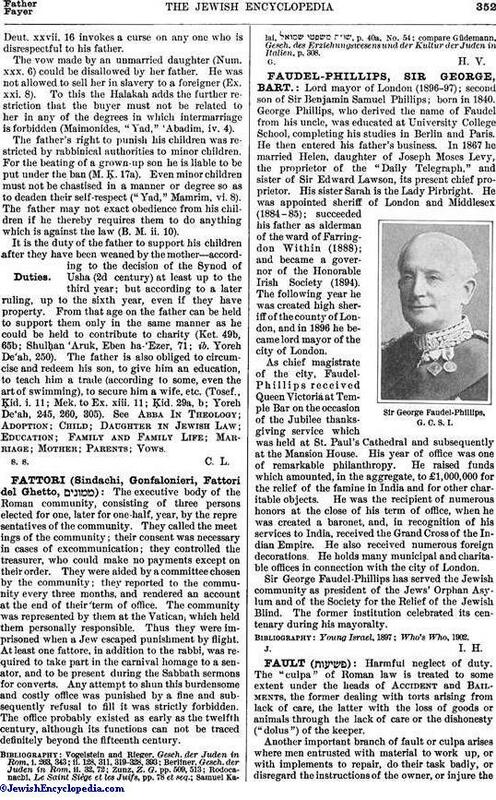 Sir George Faudel-Phillips, G. C. S. I. Sir George Faudel-Phillips has served the Jewish community as president of the Jews' Orphan Asylum and of the Society for the Relief of the Jewish Blind. The former institution celebrated its centenary during his mayoralty.